A pair of otherwise devout nuns at the struggling Sisters of Perpetual Sewing have a juicy secret: For years, they’ve been bottling wine under the nose of their teetotaling Mother Superior in order to keep the convent afloat. 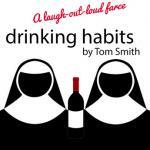 That premise alone is enough to promise an evening of nunnery fun, but audiences at the Artesia Community Theatre’s production of Tom Smith’s “Drinking Habits” are in for much more as deception runs rampant before the truth ultimately sets everyone at the abbey free. Fellow reporters and formerly affianced couple Sally and Paul, played by Melynda and Cary Roberson, have sneaked into the small convent to search for evidence that might help them blow the cork off a rumored illegal wine-making racket in the community. Paul is a less-than-enthusiastic accomplice for the big-scoop-driven Sally, more interested in the potential of repairing their work-damaged relationship than outing the nuns. The Robersons’ natural chemistry lends itself smoothly to the professional and personal tug-of-war between the two journalists. Their comedic talents shine through soon after when Sally is accidentally discovered by Mother Superior, who mistakes her for the new nun the convent is expecting. Frantically dubbing herself “Sister Mary Mary,” Sally now has the break she needs to investigate from the inside. Paul, meanwhile, becomes unwillingly involved as “Father Paul” when he’s also caught in clerical cloth. 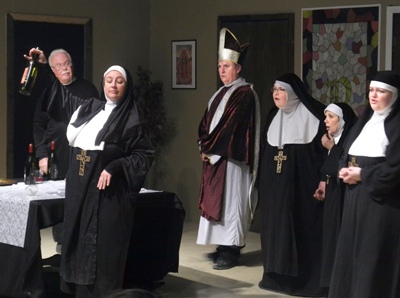 The mayhem begins when it becomes apparent that Mother Superior, played to pious perfection by Rebecca Griffin, and Father Chenille, loveably rendered by ACT veteran Brent Hammett, do suspect spies are in their midst – but from Rome rather than the local rag. As the Mother attempts to out the actual new “nearly nun” Sister Mary Catherine, played by Lauren Austin, and Father Chenille adds another partial priest to the mix by recruiting good-natured groundskeeper George (Murphy Davis) to keep tabs on Father Paul, the web becomes increasingly tangled. And through it all, the original tipsy secret is interwoven by the rollicking tag team of Sister Augusta (Melanie Dippel) and Sister Philamena (Becky Terpening). Dippel and Terpening’s well-timed antics, Austin’s increasingly tormented Mary Catherine, Murphy’s affability as George, and the Mother and Father’s mounting paranoia work as a crescendo behind the progressively tenuous and hilarious nature of the Robersons’ ruse. The hysterical twist ending of director Glenna Brady’s efforts stitch the chaos up as neatly as a straight seam. Three more performances of the play are slated: 7:30 p.m. today and Saturday, and 2 p.m. Sunday. Tickets are $15 each, cash or check only, and may be purchased from any cast or crew member, by leaving a message at 748-3444, or at the door as seating allows. Doors open at 7 p.m. today and Saturday, 1:30 p.m. Sunday. A cash bar is also available. The production is sponsored in part by HollyFrontier.